Position the oven rack in the lower 1/3 of the oven. Preheat the oven to 400 degrees. In a large bowl, combine the onion, parsley, parm cheese, bread crumbs, egg, marinara, garlic, red pepper flakes, salt and pepper. Once mixed, add in the beef, mixing with your hands. 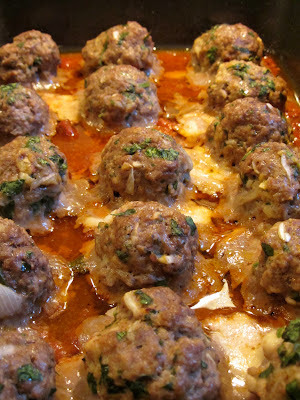 Shape the meat mixture into 16 meatballs. Make a hole in the center of each meatball and place a cube of mozzarella inside. Reform the meatball so the cheese is completely concealed. Spoon 1/3 cup extra marinara in the bottom of a baking dish. Place the meatballs inside and drizzle with a little extra virgin olive oil. Bake for 15 minutes until cooked through.